Posted in Bright Ideas / Blog on February 8, 2019. As with most industries, there are some peculiarities to be aware of when it comes to performing local marketing for law firms, some of which you can turn to your benefit when working with new clients in the legal industry. Law SEO veteran Dan Foland shares his top tips for anyone looking to get their clients ahead of the game in legal. There are few industries more competitive than the legal industry when it comes to local SEO. There are also few marketing efforts that will have the lasting impact of SEO. Pay Per Click (PPC), for example, stops working the second you stop paying, while SEO is more of the snowball effect. It’s a long term strategy, but it builds on itself. In fact, marrying PPC and SEO (among other marketing efforts like direct mail) is a great way to show your new legal clients immediate results while waiting for SEO to kick in. But, if your client’s new law firm is in Houston, Texas, for example, you can expect to pay anywhere from $116 to $250 per click when bidding on ‘car accident lawyer’, a price that may be prohibitive for new law firms. Law firms are local businesses, so local SEO should obviously be high on your list of marketing priorities. You’ll need to build their local visibility and local strategy from the ground up. The legal industry is one of the few industries where attorneys are individual practitioners and their own entities, so they may already have visibility outside of their previous firms. In my SEO experience for law firms, GMB can be your best friend if you put in the time. Ranking well in the 3-pack is no cakewalk, but it can be the equalizer against larger, more established law firms. In my experience, it is not as difficult or as lengthy of a process as what’s required to rank well in traditional organic search. Google Analytics does a bad job of attributing GMB website clicks. To truly see how your GMB listing is performing and converting, you should add a UTM code to your website URL in GMB. If this sounds foreign to you, no worries, there are plenty of tools to help you generate UTM codes. I often suggest this tool to those new to UTM code generation. Note: Just recently, Google Search Console stopped showing impressions for URLs that use UTM codes in GMB. Instead, Google attributes those impressions to the canonical URL. For example, instead of Google showing impressions for ‘website.com/?utm_source=google&utm_medium=gmb’ Google will just attribute those impressions to website.com. GMB itself, however, is still reporting clicks to URLs with UTM codes separate from the canonical URL, at least for now. In my opinion, you still get insightful and more useful information in Google Analytics. Next, and more importantly, in my opinion, is using a unique call tracking phone number for GMB. GMB Insights can only show you a percentage of people who’ve called your clients directly from their listing. GMB is only able to report on callers who use click-to-call. They can’t report on users who physically type your client’s phone number into their phone. Most desktop users and many mobile users can’t or don’t know how to use the click-to-call feature. Reporting back to your client on how many people actually call them from GMB will only make you look better. Otherwise, it’s hard to attribute the source of those phone calls back to your work. In the most recent annual Moz Local Ranking Factor Survey experts said that Google My Business signals (categories, proximity, keywords in business name) are some of the most important ranking factors. Choose the most specific categories possible as your primary category. If your client is a criminal defense attorney, for example, I suggest having your primary category be ‘Criminal Justice Attorney’, with ‘Law Firm’, ‘Trial Attorney’ etc. as your secondary categories. 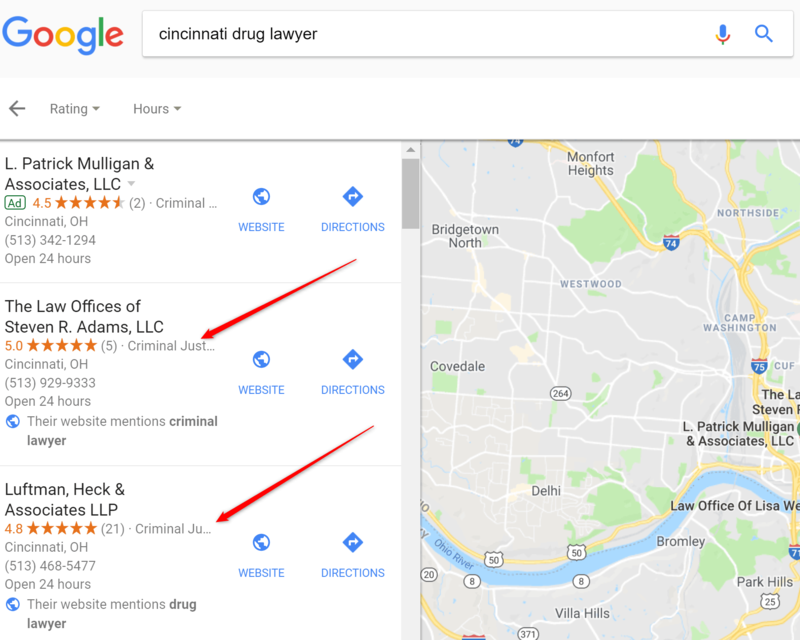 To illustrate this point, try searching for ‘cincinnati drug lawyer.’ You’ll see that the first 12 listings (as of writing) all use ‘Criminal Justice Attorney’ as their primary category. GMB’s ranking algorithm is unique and separate from their organic algorithm. 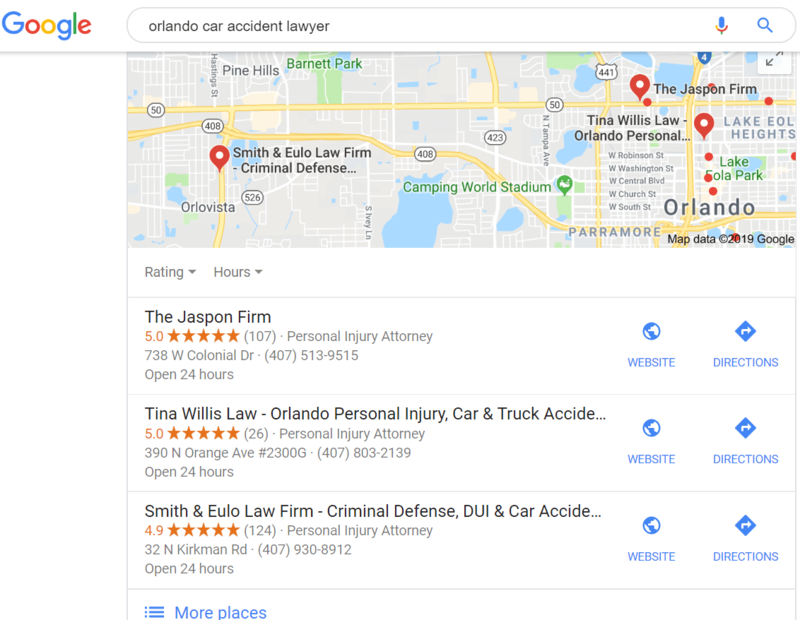 It’s not uncommon to see law firms rank well in organic search, and struggle to have any real visibility in the three-pack/maps and vice versa. If you look through the organic results you probably won’t find Smith & Eulo Law Firm show up for the same query until page three or four. You’re probably saying “Hey, Dan, they have ‘car accident lawyers’ in their business name on GMB, and maybe that’s why they rank so well in the 3-pack for this term”. I agree, and this highlights how separate and distinct Google’s organic and local algorithms are. Unfortunately, GMB’s local algorithm is much more vulnerable to manipulation. As you can see in the above screenshot, two of the three top listings are stuffed with keywords which are helping them rank well (among other factors). This is a clear violation of GMB guidelines. The legal industry is one of the most competitive and spammy industries I’ve seen when it comes to local SEO and GMB. We constantly see fake reviews and fake office locations being used, both of which are against GMB guidelines. If your client’s competitors are spamming Google, I recommend reading Joy Hawkins’ article on how local businesses can fight spam in local results and also joining this upcoming spam-fighting webinar. I highly suggest putting in the time and effort to find and report GMB spam/manipulation. It’s one of the quickest ways I’ve found to get new law firms immediate results. If you’re thinking about using shady tactics like these, think again. Not only do they break GMB’s guidelines, but lawyers also have a strict set of ethics guidelines they have to follow. Rule 8.4 (c) of the Model Rules of Professional Conduct states that it is professional misconduct for a lawyer to: “(c) engage in conduct involving dishonesty, fraud, deceit or misrepresentation.” It’s safe to say fake reviews, fake business names, and fake business locations fall under this clause. While some rules like the above are used across all jurisdictions, each state has their own ethical obligation guidelines that may not be so straightforward. Recently there was a case where a woman sued her law firm over fake reviews. You don’t want to be the person responsible for an ethical violation or lawsuit against your client. On top of general citations like Yelp, Foursquare etc. there is a multitude of legal-specific directories. There are probably thousands, but many are pretty useless in my opinion. When choosing which legal directories to join you should think about it from a potential client’s perspective. Are potential clients actually going to find your clients through this directory? Does it feel like it was just built to make money off ads and memberships? Does it provide any unique value that the other thousand directories don’t? Additionally, it’s clear from recent research that links from directories don’t have the effect on rankings that they used to, so the key benefits here are added visibility and value from things like reviews on directory listings. Kick off your client’s new law firm by spending the time working on their GMB listing and legal directories. Many people set up their GMB listing and think they’re done. You can get ahead of the competition by asking clients for reviews, reporting competitor spam, and optimizing your listing with images, videos, category selection etc. Top legal directories are not only useful for the backlinks and SEO value, but they actually bring in clients. SEO is not only for Google, as directories are their own search engines. Each one uses their own ranking algorithms and spending the time to optimize for them can pay off, big-time. Dan Foland is the SEO Director at Postali, a marketing agency that helps law firms find new clients. He is also a Google My Business Silver Product Expert as well as a Local Search Expert at the Local Search Forum.